Minnehaha County is a county located in the state of South Dakota. Based on the 2010 census, the population was 169,468, making it the most populous county in South Dakota. Its county seat is Sioux Falls. The county was created in 1862 and organized in 1868. It received its name from the Sioux word Mnihaha, meaning "rapid water," or "waterfall" (often also incorrectly translated as "laughing water"). Minnehaha's name is taken from a Native American word meaning river waterfall. Minnehaha County was created in 1862, organized in 1862, and reorganized in 1868. Minnehaha is an Indian word used to describe a falls in a river. 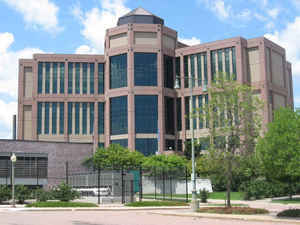 The county seat is located in Sioux Falls, one of the first town developments in the county. As reported by the Census Bureau, the county has a total area of 814 square miles (2,107 km2), of which, 810 square miles (2,097 km2) of it is land and 4 square miles (10 km2) of it (0.49%) is water. The Big Sioux River flows through it. The County of Minnehaha is situated in the southeastern part of South Dakota, and is about equidistant from the northern and southern limits of the famous Sioux Valley. It is bounded on the east by Rock county, Minnesota; on the south, for a distance of seven miles, by Lyon county, Iowa, and by Lincoln and Turner counties; on the west by McCook county, and on the north by Lake and Moody counties, South Dakota. It is twenty-four miles in extent north and south, and thirty-four miles east and west, and contains twenty-four townships, the eastern tier being fractional. The general surface is undulating, or what is usually termed rolling prairie; except to a limited extent along the larger streams where it rises abruptly and is more or less broken. The soil is a rich black loam from one to three feet deep, with a fertile porous subsoil. For the growing of cereals and vegetables the soil is unsurpassed, and its productive properties are not appreciably diminished by successive crops without the use of fertilizers. Two valleys along the banks of the Big Sioux river and Skunk creek extending nearly through the county, north and south, are worthy of mention.